Football is one of the most popular sports in India. Football(Indian)/soccer need very minimum amount of equipment’s. We can start playing with just a football & a good pair of shoes. 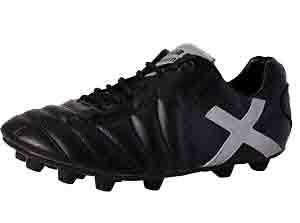 Football boots are also called cleats/studs. 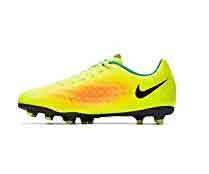 Wearing a good and comfortable pair of cleats will improve your playing to some extent. Comfort is most important factor, therefore choose the right size. If you are young and still growing it is ok to buy little big one, but Don’t get a size too big. but adults should buy exact size. Other important things are shape of feet and needless to say, comfort. To get traction in different type of surfaces different type of sole plates are used. Hard ground shoes, soft ground shoes and indoor practice shoes, are different. They differ in use adjustable/fixed studs, sole shapes, sole material etc. So you need to choose based on the surface you play on. Shoes made with astro soles are used on artificial turf and other hard surfaces. Soft/muddy surface need more grip and therefore adjustable metal studs are used. In indoor playing space Non-marking soles are used for good grip and traction. Also consider the position you play & playing style, while choosing cleats. This gives you an extra advantage on your game play. For example it would be good to use more light weight cleats when you play as forward or wing position. 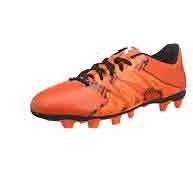 You can choose football shoes form top brands in India like Nike, Adidas, Nivia, puma etc. But other less known companies are also making quality shoes. These are available at less price & it does not means that, they are not good as popular brands. Precision Kicking – One of the most important advantage of football shoe over other shoes is hat, they are designed for precision kicking. Difference in cushioning – Running shoes have extra cushioning in heel. 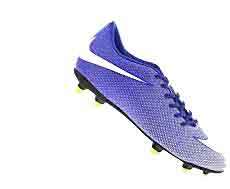 But football shoes are more fit than other shoes. This helps in kicking, quick turning, passing the ball etc. The Studs – cleats are designed for playing on slippery, grass, muddy surface, with more grip. This helps in starting and stopping fast. This also prevents slipping. Adjustable or fixed studs are used for this purpose. Running shoes are more comfortable while worn for long time, they also have extra arch support. As a conclusion, running shoes tries to improve long term use, comfort and more support to foot.On the other hand, football shoes gives more importance to precision kicking, gaining traction and are more closely fitting around our feet. 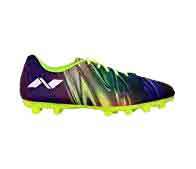 Following is the list of best football shoes available in India form top brands. Material – Direct injected moulded TPU for best feel and precision passing and kicking. Upper & Sole made of ”Air Mesh”. Material – Thermoplastic polyurethane (TPU) Sole and PU Outer Material. Material -Sole Material is Rubber and Inner Material Synthetic. This shoe is best for “turf grounds”. 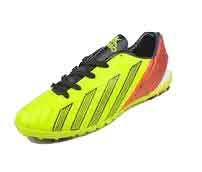 In this price range, you can get shoes from world famous brands like Adidas, Nike etc.